It doesn’t take a rocket scientist to understand that if you love working in your office, you will spend more quality time there. And, if work feels like play, you will be more creative and prosperity will naturally flow. In Feng Shui, the “Career” area is about doing our life work. It is not about work as drudgery. It is about doing vibrant work that flows from our deepest core.Feng Shui offers some simple, practical, and inexpensive solutions that will support you in arranging a work space that inspires creativity, productivity, and prosperity. As a Life Coach as well as a Feng Shui Consultant, I work with many people who want to make a difference in the world. Whether they provide coaching services, sell health-related products, or are a holistic health practitioner, their vision encompasses enhancing the health and happiness of others and the planet. This is why arranging an office that encourages you to spend time there is directly connected to your vision. Make sure your office reflects your passion, incorporating objects, words and symbols representing that represent them and eliminating anything that does not. This is not the place for lots of family photos, objects from other hobbies or past rewards not related to your current work.This is your palette for creating the work that is uniquely you. Treat it as your sacred space. 1. Clear the clutter: Often home offices are a dumping ground of all of those bits of things you can’t find a place for. Be diligent and don’t allow anything in the space that does not support your vision, uplift your spirit, or is necessary and functional to your current work. If you work at a company, the shape of your office is broadcasting a message about your competency. Make sure it is sending the message you want! 2. Get organized: If you are spending half your time looking for things, you are losing precious time. If you are not good at this, hire an professional organizer to do the initial set-up – budget permitting. If you can’t pay for it, offer a trade of services to a friend, colleague or family member who has good organizing skills. 3 Arrange your desk so that it is in the empowered position: This is where you can see the door from the desk but are not in direct alignment with the door. This will make a huge difference in your ability to feel in control of your destiny. If you can’t move your desk, get a mirror and place it so that you can see who is coming in the door. These look like rear-view mirrors and stick right to your monitor and can be found at auto parts stores. 4. Create an ergonomically comfortable work station: Your body must feel comfortable working there. Make sure your desk is the appropriate height, have a comfortable chair, and arrange to have copy machines and other chemical-emitting machines away from your work station. If your body hurts, or you are smelling fumes, you are not only harming yourself, but it will create another aversion to spending time there. 5. Balance open spaces with filled spaces: This is called balancing the Yin and Yang. You need places for the eye to be engaged as well as for it to rest. Organize all of the bits of office things such as staplers, tape, etc. into colorful baskets. The eye will see one object rather than many, creating a sense of organization, and peacefulness. 6. Make it a bright and happy space: This should be an active space. You don’t want it to be so calming that you want to take a nap. Bring in vibrant colors as well as art and objects that make your heart sing. Replace fluorescent lighting when ever you can. Bring your own floor and/or desk lamp to work, if possible. It will make a huge difference in your energy level at the end of the day. 7. Organize those snake-like computer cords so that you are not looking at a jumble of chaos. Radio Shack has cord organizers which allow you to group them into long, wide tubes. Or roll them up, put a twist-tie on them and drop them all into an attractive basket. 8. Make it inspiring: Bring in nature and collections that you love. This is called balancing the Five Elements. Use book shelves to display a beautiful vase, work of art, a shell, or a few objects from favorite collections, and intersperse them with your work books. (Use plants, water fountains, and nature art; See Feng Shui Chi Enhancers.) Make it beautiful and inspiring but don’t over do the collections. 9. For Feng Shui believers, arrange objects according to the Bagua Map. (Click here for your Free Bagua Map.) The Bagua Map locates the key energetic centers of a home or room. We then bring in environmental affirmations to enhance these areas. When we strategically place objects that represent what we want to bring into our lives, we set the intention for the chi or energy to flow in that direction. We can use a “mini-Bagua” in our office by orienting the “entrance quadrant” from the direction we enter the room. Divide the room into nine equal sections and put your affirmations (objects, words, artifacts, vision boards) representing what it is you want to bring into each of these areas of your work life into these quadrants. Use a purple amethyst or favorite crystal in the Wealth area. A water fountain, something made of glass, or a picture of flowing water in the Career area. Books pertaining to your work in the Knowledge area. A lamp, an award, or a framed article about you or your company in the Fame area. Pages of the book you are writing or projects you are working on in the Creativity area. A green plant in the Health area. A picture of the people you want to partner with in your Partnership area. Note: when using the Bagua for business, substitute the word Partnerships for the Love and Marriage area. Pictures or objects that represent helpful people in the Helpful People area. This area is also for travel, so don’t forget all of the exotic places you want to travel to where you will be sharing your gifts with the world! Desk in the Center area, representing a grounded and balanced work life. If this is not possible, just make sure the center is open and clutter-free. Make it up, make it fun, make it personal to what you want to bring into your career, and enjoy the productivity that will come from being in an inspiring, organized, and clutter-free space! For your free Color Bagua Map click here. Your home holds information about belief systems that may or may not be serving you. You can train yourself to see them by looking at exactly what is there. By acting on this information, you gain valuable tools for transformation and personal growth. My client Elinore’s living room walls were filled with large, expensive oil paintings of her husband’s dead relatives. Sort of like the ones you might find in a castle with everyone looking very severe and disapproving. She hated them but did not have the nerve to tell her husband. He had inherited them and as the only son of a wealthy family, wanted to have them up, but they had a very small home. She had no room to put any of the pictures that she loved. Her space had an important message for her if she was willing to see it. In Elinore’s case it revealed that she didn’t value herself enough to have that “courageous conversation” with her husband about not feeling comfortable in her own space. She didn’t feel worthy of asking him for this important thing. She could have presented him with options; he could put them in his own office or even give them to other relatives. Because she could not speak up about her own needs, she was consigning herself to live with the “eyes of the disapproving relatives” eternally following her around the house. It is our personality that resists confrontation. It fears we may lose all by speaking up. The truth is that we may lose if our relationships are built on sand, but if they are substantial, our loved ones will come around and our relationships will be better for it. Feng Shui teaches that every object in our homes and gardens has a consciousness, which is called energy or chi. It is interacting with us and we are interacting with it on subtle, and not-so-subtle levels. We are continuously “painting” where we are in life into our physical surroundings. Whether we like it or not, our space is reflecting our inner psychology. By reading the messages that are there in our surroundings, we can gain valuable insights, bringing us the personal growth that our soul seeks. As we study Feng Shui we learn to see our homes with a new pair of eyes. I have been eternally grateful for the simple messages that my homes have provided about what is going on in my inner world. As a person who has always been on a path of personal growth, I welcome these valuable insights. One example was when I got it about the impacts of having too much stuff. I started making myself have just one or two objects displayed on a surface rather than my usual seven or eight. I realized my home looked like the homes I staged with lots of decorative objects filling every corner. There were no unfilled surfaces. In meditating why this made me uncomfortable, I suddenly saw the simple lesson that was embedded energetically into my home. I realized that I filled my social calendar the same way I filled my home. Every corner was busy! My home, like my life, reflected a lot of doing and not much being. I was uncomfortable creating more spaciousness in my life and there it was reflected in my home! By creating more spaciousness in my living space, I created an environmental affirmation which reflected my intention to spend more time developing my inner landscape. This translated to more time spent in self-reflection, meditation and yoga. As a result of my home becoming more balanced, my life also came more into balance. There are invaluable messages embedded in our space that can change our lives for the better. Feng Shui teaches us to look at our space in new ways which allows for many powerful “ah hah” moments. Subtle changes in our living space often produce big changes in our lives. Although everything in our environment provides valuable information about our inner beliefs, the easiest way to start is by looking at your artwork. What is it telling you about your belief systems? The overwhelming wall of family photos in the hallway often reveals that the client’s life has been overwhelmingly about family in an un-balanced way. Often her children have grown and she is now faced with not knowing who she is. I recommend weeding out some of the family photos and adding pictures of the client doing fun things with friends or by herself. By affirming this new way of being, she brings it into prominence in her life. She begins to attract friends and experiences that affirm her as a individual, enriching her life and filling the “empty nest” with her new sense of self and purpose. You may also want to look at what is not there. Often a home with no pictures on the walls or sparse furniture reflects an inability or fear of commitment. A fear of making choices that are wrong, so no choices are made at all. It can also reflect a lack of commitment to your living space. You may not like it and are hoping to find something you like better when you can afford it. 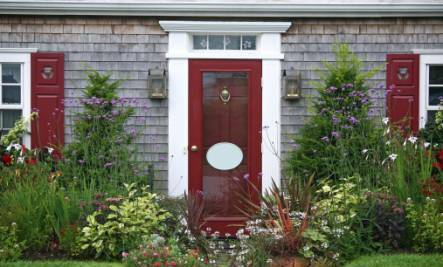 I have found time and time again when a client fully commits to where they are living now and makes it wonderful, the doors open pretty rapidly to a better place. Many of life’s lessons can be found in the Feng Shui of our space. It’s quite simple really; when we feel better about our living space, we become happier people. Happier people attract others who want to spend time with them, who will often bring opportunities along as well. A home that lifts your spirits and reflects your true tastes, loves and desires, makes you happy. In doing so it is amplifying the happiness quotient in your life and attracting more of it. Consequently, a home that always drags you down because of the accumulation of all the little things that bug you, is continuing to attract more of what you don’t want. Western Feng Shui, which is the form that I teach and practice, is not about hanging mysterious crystals and wind chimes in strategic places. It is not about some “woo woo” superstition that is too complicated to figure out. You will unfortunately encounter many books that try to make it mysterious, but the skinny on Feng Shui is that is is simple. By working on your home to make it a more pleasing place for you and/or your family to be, you are changing your energy. You simply feel better, hence are more enjoyable to be around and you start to experience a domino effect of positive things happening in your life! The ancient art ofFeng Shuiacknowledges the profound affect of color on our physical, emotional and spiritual well being. According to Feng Shui colors are connected to the five elements from the natural world; fire, earth, metal, water and wood and play a significant role in balancing our living spaces. This is called the Five Elements theory and it is at the foundation of Feng Shui and Chinese medicine. These elements also have objects, shapes, seasons, body organs, chakra’s and colors connected to them, but the color component is often the most powerful. Listed below are the main rooms of the home and the best wall color choices for them according to Feng Shui principles. Keep in mind there are other schools of Feng Shui which may differ. This list comes out of the Western Form School philosophy which is the one that I write about and teach. Use these suggestions as guidelines only. Pay attention to your intuition. It is our inner Geiger-counter and is always seeking health and balance. The colors you feel passionately about are most likely the ones that you actually need to surround yourself with. Make sure the colors you choose are the ones that make your heart sing! Best colors: Earth tones, flesh tones pastels including light sages, colors that are more muted. Why? Kitchens should be happy active (Yang) spaces but they also already have a lot of fire and water. The best element to balance both is the earth element represented by earth tones and terra-cottas. These can be bright yellow, golds, rich terra-cotta or any other brighter color. The earth element supports being grounded. In kitchens we are working with fire and knives, which are unsafe. Using colors from the water element such as black, grey, dark blues, greens and browns promote a feeling of un-groundedness, they can also be too depressing for what should be a more active and happy space. Don’t recommend: Reds, unless you want to eat a lot more… red stimulates everything, including appetite! Black, grey, navy blue, dark green or dark brown are also too watery. Best Colors; Brighter colors are fine for these more active (Yang) spaces. Choose any color that you love. White and cream colors are excellent for home offices because they represent the metal element which supports mental clarity. Don’t recommend; Darker tones or any color that reflects the water element which is too floaty and ungrounded. Painting is a commitment of time as well as finances. Don’t be in a hurry and choose the wrong color. Also remember if it seems too bright for the more active rooms, once you get the furniture in and art up, it will look very different and may work out fine. 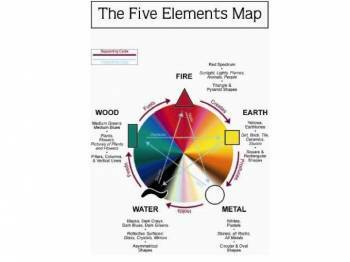 If you would like a free Five Elements Color map which lists the objects, shapes and colors that represent the Feng Shui five elements, click here, Enjoy! By Erica Sofrina, Author of Small Changes Dynamic Results! Feng Shui for the Western World. Erica Sofrina is a motivational speaker, author and life coach specializing in connecting people to their spiritual essence. She is also an Internationally recognized Feng Shui speaker, teacher and the author of the book Small Changes, Dynamic Results! Feng Shui for the Western World and the Founder of the West Coast Academy of Feng Shui. She is also the founder of Earth Spirit Adventure Travel which takes people on retreats to powerful energy vortexes such as Bali and Hawaii to facilitate their deep earth/spirit connection. 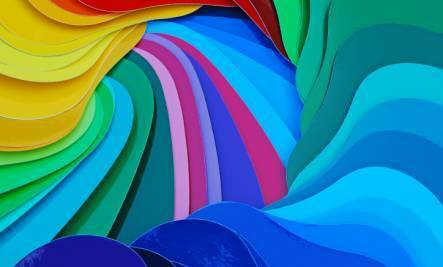 Most of us feel passionately about color. We love some and are repelled by others. Our tastes also change over time. I remember how passionately I loved blue as a child and, as an adult I couldn’t get enough of yellows, golds and earth tones. My most favorite colors now are Indigo blue combined with gold and pumpkin-orange. They absolutely make my heart sing and it never ceases to cheer me up when I see this combination. The ancient art of Feng Shui acknowledges the profound affect of color on our physical, emotional and spiritual well being. 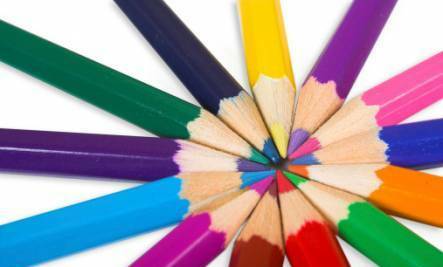 Colors are connected to the five elements from the natural world; fire, earth, metal, water and wood. They play a significant role in balancing and healing every aspect of our lives. In paying attention to the colors we are attracted to, we are tuning into our body’s natural instincts which can help us come back into alignment. This is called the Five Elements theory and it is at the foundation of Feng Shui and Chinese medicine. These elements have objects, shapes, seasons, body organs, chakra’s and colors connected to them, but the color component is often the most powerful. Fire: when you are working with issues around decisiveness, assertiveness, motivation and passion, or lack there of, bring fire colors into your living space and wear some fire colors. Fire Colors: The entire red spectrum which includes pink, red, orange, coral, purples. Red’s however can come in many different hues. The ones closer to red will have more energy, think fuchsia. Those with more blue will be cooler, such as purple. Pastel pinks are considered the metal element with a hint of fire. Wear pink to inspire lightheartedness and romance (Feng Shui for Romance). Earth: When you are working with fertility issues, being and feeling more grounded in your life and getting organized. Earth Colors: Taupe, gold, yellows, medium brown, terracotta and earth tones. Gold is considered the happiest color on the planet. Think ‘sun‘. Metal: When you are working with mental clarity such as focusing on a new project at work, studying a new subject or when you need some back bone. Metal colors are important when you feel the need to lighten up and develop your child-like qualities and/or you are working with children. Metal Colors: whites and pastels (pink, light green,light blue, light yellow) and metallics. Water: When you are working on developing your spirituality, practicing mindfulness, connecting to intuition and learning how to tune into the synchronicity of the universe. Water Colors = Black, dark gray, dark and navy blue, dark green, deep purple and Indigo. Blacks can be overwhelming so don’t overdo them, especially in the bedroom! Wood: When you are working on personal growth, growing or expanding your business, planting the seeds for a new project or working with health and/or family issues. Wood Colors: medium green and medium blue, turquoise. Medium blue is the most favorite color and actually belongs to the wood element, not water. Darker blues belongs to the water element. If you would like more information on how to work with color and the Five Elements, I am offering my readers a free copy of my Color Five Elements map (PDF format) like the one shown above. Click here for your free copy. By Erica Sofrina, author of Small Changes, Dynamic Results! Feng Shui for the Western World. Erica Sofrina is an Interior Design and Feng Shui specialist and founder of the West Coast Academy of Feng Shui. 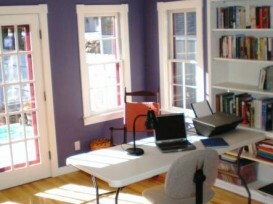 One of her specialties is color consultations for home and business. Have you ever been in a room that didn’t feel good to be in but you couldn’t figure out what was wrong? Chances are the Yin/Yang components were out of balance. 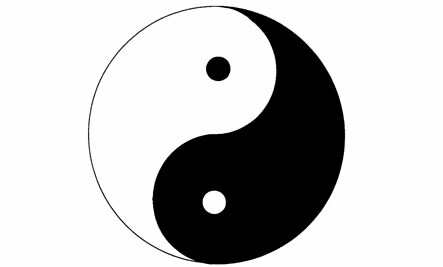 Yin and Yang is at the foundation of the Ancient Practice of Feng Shui. It has to do with the recognition that the universe is made up of opposite forces of energy, which cannot exist without each other. They are finely balanced and, like polar sides of a magnet, are innately attracted to each other. The Yin/Yang symbol (picture at top) depicts two fish gliding together in perfect balance. Each carrying components of the other; the black fish with the white eye and the white fish with the black eye. The two swim together in perfect harmony creating a circle, the most ancient symbol depicting wholeness. Feng Shui acknowledges that we are ancient creatures who naturally seek balance. If our living spaces are not balanced, our lives feel out of balance as well. By learning to work with the Yin and Yang components in our homes, we create supportive spaces that bring our lives back into harmony as well. The concept of Yin refers to the feminine principle, which is passive, dark and yielding. Yang refers to the male principle, which is bright, active and extroverted. In physical environments Yin objects would be reflected by circular shapes, darker more muted colors, lower darker rooms, upholstered furniture of soft chenille, velvet and corduroy fabrics, carpeting and area rugs, and smaller detailed prints. In building materials adobe, brick and stucco would be considered more Yin materials. In design history, the eras that incorporated Yin qualities would be the Victorian era, Louis IV and VI and the Baroque period. In architecture the Bauhaus period in Germany from around 1919 – 1933 was the beginning of modernist design utilizing more Yang components. Slick glass and mirrors, metal and plastics, high, vast ceilings, bright angular spaces, bold stripes and geometric patterns, square, hard angular furniture without detail, flooring of hard woods, cement and tile, all reflect Yang design materials and features. In balancing a home we want to first determine the use of the space and then incorporate the Yin and Yang qualities appropriate for it. Passive spaces should incorporate more Yin features and active spaces more Yang features. The key, however, is to make sure we always have some of both qualities and not an over abundance of either. Yin rooms are the places you want the energy to calm down to support rest, relaxation and rejuvenation. Yin rooms would be bedrooms, dining rooms, living rooms, possibly family rooms and bathrooms. In these rooms we would want to bring in more Yin features such as comfy furniture, more muted colors and lighting, plush fabrics and more detailed patterns and accessories. Having a bright, light ultra-modern bedroom with high ceilings and slick fabrics would not serve the occupants and will often translate to sleep disorders. Yang spaces are the more active spaces such as children’s playrooms, kitchens, gyms, home offices, laundry rooms, family rooms (depending upon the use), hallways and garages. These spaces should incorporate more Yang components with brighter lighting, whites and/or bolder colors, more angular shaped furniture and accessories with less detail. This is an example of an active Yang space. Although we don’t want sharp-edged furniture anywhere in the home. In using modern Yang qualities make sure to choose furniture with more rounded edges. Sharp-edged furniture is considered weapon-like in Feng Shui. It may be subtle, but you will never fully relax in a space that has objects that can injure you. Our homes always need to be ‘people friendly’ no matter the style of decor you are drawn to. We also want to bring in all of the Five Elements, which include plants and things that are either from the natural world or represent nature. Ultra modern homes devoid of nature will never allow us to feel truly ‘at home’ because of our deep innate connection to the natural world. The key is to have a balance of both Yin and Yang qualities in every room, emphasizing more Yin or Yang features depending upon the use of the room. Yang features will make the space more active and Yin features generate a more restful atmosphere. Make sure your design choices and styles are serving the people who need to occupy the space, and not the other way around! Once we have achieved an appropriate Yin/Yang balance in each room, we will be well on our way to creating a balanced and harmonious home that supports, uplifts and nurtures our lives! *Another powerful component of Feng Shui is working with balancing the Five Elements in our home. For those of you who would like to learn more, I am offering a free color Five Elements map to all of my readers. Click here to receive your free copy (pdf). Healthy Highway also offers the opportunity to learn more about The Five Element Theory.